Happy birthday James Lincoln Collier (My Brother Sam is Dead) and Christina Björk (Linnea in Monet’s Garden). It’s the birth date of Helen Keller (1880-1868). Read her autobiography, The Story of My Life, and Miss Spitfire by Sarah Miller. In 1922, the Newbery Medal is first awarded, named for the eighteenth-century British bookseller John Newbery. It’s given annually to an author considered to have written the “most distinguished contribution to American literature for children” by the Association for Library Service to Children (ALSC) a division of the American Library Association (ALA). For more information about Newbery Medal winners and Newbery Honor books, visit the Newbery Medal Home Page. June has been designated the Great Outdoors Month, to celebrate our nation’s natural beauty and renew our commitment to protecting the environment. In June many people and families head to the great outdoors, often to camp out. Many children go to camp for a week or two, giving them experiences that they might not have at home. What if you do not naturally appreciate a camp of any kind? Enter our heroine of the day Babymouse. She’s signed up for two weeks of sleepaway camp, and she’s not exactly the camping type. Even garden hoses and sticks remind her of snakes. Dropped off at Camp Wild Whiskers with enough cupcakes to feed an army, Babymouse tries to make a good first impression on her camp mates, flinging her arms out wide and yelling, “HI EVERYONE! I’M BABYMOUSE.” Unfortunately, none of her cabinmates—including a skunk, cat, and dog—seem impressed. From there things just go downhill. Babymouse constantly racks up demerits for her cabin, the Buttercups. She’s a camping disaster and creates havoc whether she makes bracelets or tries to find her way home out of the woods. 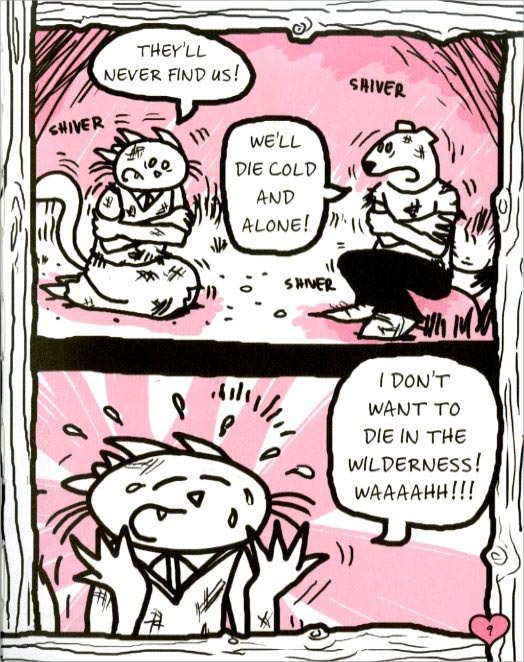 Babymouse is a trier—in fact she tries everyone’s patience to the point that her camp mates wish she’d go home. Finally, even her active imaginative life where she stars as a superhero and always saves the day, doesn’t keep her going, and she’s ready to bail on the outdoor experience. At the last minute she finds a way to become a team player and bring at least small success to her newfound friends. 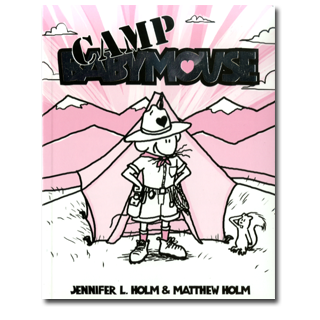 In their series of graphic novels about Babymouse, brother and sister team Jennifer L. and Matthew Holm have created one masterful book after another. From attractive pink covers through page after page of action rendered in black, white, and pink, young readers just whiz through these ninety-page books. Once a reader age four through ten has found one of the sagas about this endearing protagonist, they long for more. Fortunately, this talented duo continues to create one great book after another. If you haven’t yet met this incredibly popular heroine, Camp Babymouse will make you a convert. I myself am just grateful that no one is sending me to any sleepaway camp this year, but if they were, I’d definitely bring Babymouse—not to mention scores of cupcakes—with me. Originally posted June 27, 2011. Updated for . This is the first I’ve heard of Babymouse, but I just looked up the authors and their books and I know what’s going to be on our library list for tomorrow! What fun. And I think Babymouse is my kind of mouse…my idea of camping is staying at a hotel without a swimming pool!! Are you in for a treat! My granddaughter discovered the “Babymouse” series while in 1st grade. She has read all of them in our Library. I need to tell her about this title. These books are a great transition from picture books to chapter books. The cartoon format has high appeal. I’ve been looking forward to your Babymouse essay for months. I truly believe that the Babymouse books made me a better school librarian. I hope Jennifer and Matthew Holm keep writing Babymouse for a long time.